The first step in creating a program is to share a clear understanding of what program to create. To do that, we need a scenario. The bank manages the account. The bank registers the account. The bank searches for an account by account number. The bank can find the account by the name of the account owner. The bank can view a list of all accounts. The account consists of the owner name, account number, and balance. The account has a deposit and withdrawal function and a balance check function. Whenever there is a change in the balance in the account, it is recorded in the transaction history. Transaction details consist of date of transaction, transaction time, deposit / withdrawal, transaction amount, balance. You need to extract the classes, fields, and methods from the scenario. In a scenario, a noun corresponds to a class or field, and a verb corresponds to a method. A class diagram represents not only the structure of a class, but also the relationship between objects and objects. If two classes are connected in a line in the class diagram, the objects created from the two classes are related. 0 or * means the maximum number of objects to write as a part. 0 .. * means zero or more. An arrow is the direction in which an object calls the methods of another object. In addition to class diagrams, there are Use Case Diagrams and Sequence Diagrams. 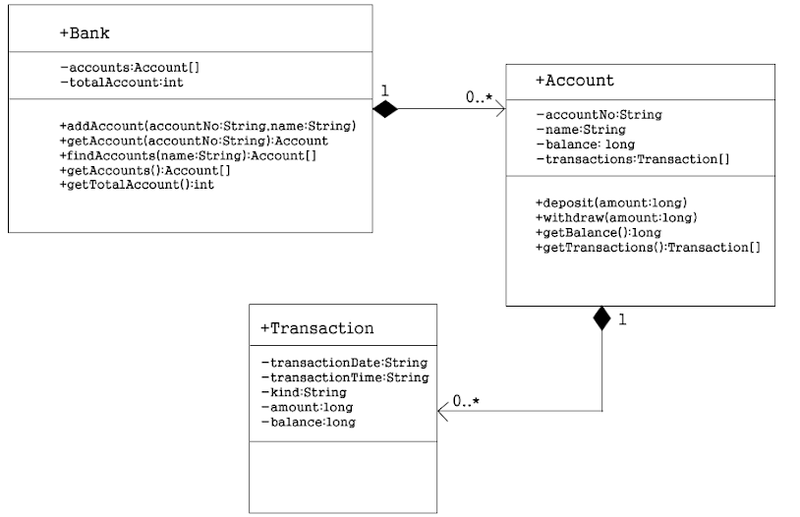 Depending on the project, various diagrams may be needed, but a bank diagram is enough for a class diagram. In the class diagram, private is represented simply as -, public as +, and protected as #. In the class diagram, the methods of the Transaction class are omitted. Bank and Account have also omitted the guessable getter and setter methods. Since the analysis is not perfect, the implementation source may differ from the class diagram above as the process progresses. A relationship in which an object has an object as a part is called a "has a" relationship. Both classes have a "has a" relationship because "bank has multiple accounts" is a right word. The "has a" relationship, which has a high degree of coupling, is called Composistion and is represented by a diamond filled in the class diagram. In a high degree of coupling, parts disappear as the body disappears. The "has a" relationship with a low degree of association is called an aggregation and is represented by a hollow diamond. In low coupling, the parts do not disappear even if the body disappears. In Java, both the Composistion and the Aggregation are implemented as member variables with reference to the part object. For reference, in Spring, one of the Java frameworks, a member variable corresponding to a a part is called a dependent variable.